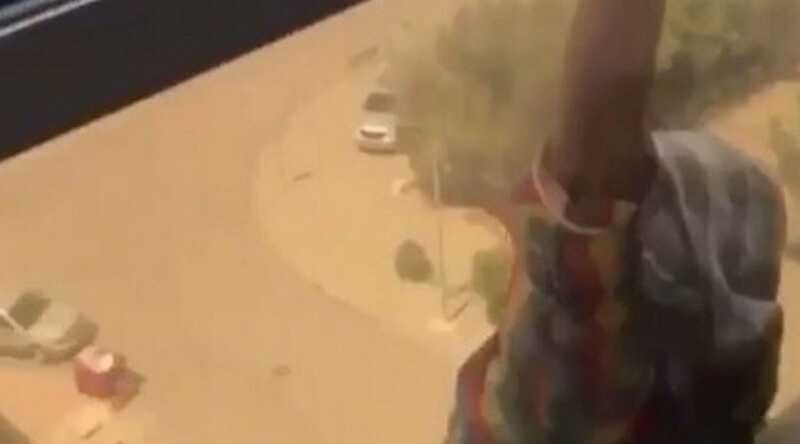 Kuwaiti police have arrested a woman for filming her Ethiopian maid falling from the seventh floor of a building in an apparent suicide attempt, according to local media and a rights group. The employer made no efforts to save the desperate housekeeper. Footage posted online shows the terrified maid screaming while clinging to the outside of the building, in an apparent last-minute change of heart. She shouts at her employer, making direct contact with the camera in a desperate plea for help. The woman filming the incident makes no effort to come to her aid, but instead continues taking footage. She can be heard telling the maid, "Oh crazy, come back," according to AFP. The maid then screams "hold me, hold me," just before losing her grip and falling. Her life was fortunately spared after hitting an awning, rather than the pavement. Paramedics can be seen rescuing the maid at the end of the video. They rushed her to hospital, where she was found to have a broken arm, as well as nose and ear bleeding. Kuwait's criminal investigation police have referred the employer to the prosecution over failing to help the victim, according to Al-Seyassah newspaper. The Kuwait Society for Human Rights has also called on authorities to investigate the case and refer it to court. Two-thirds of Kuwait's population is comprised of migrant workers, according to Human Rights Watch. Although the country passed a law in 2015 that gave domestic workers more rights as employees - including paid annual leave and the right to a weekly day off - protections are still weaker than those which safeguard other professions. Those who employ maids and other staff in their homes are not subject to enforcement mechanisms such as inspections of working conditions. Thus, many domestic workers still complain of abuse, mistreatment, and non-payment of wages.